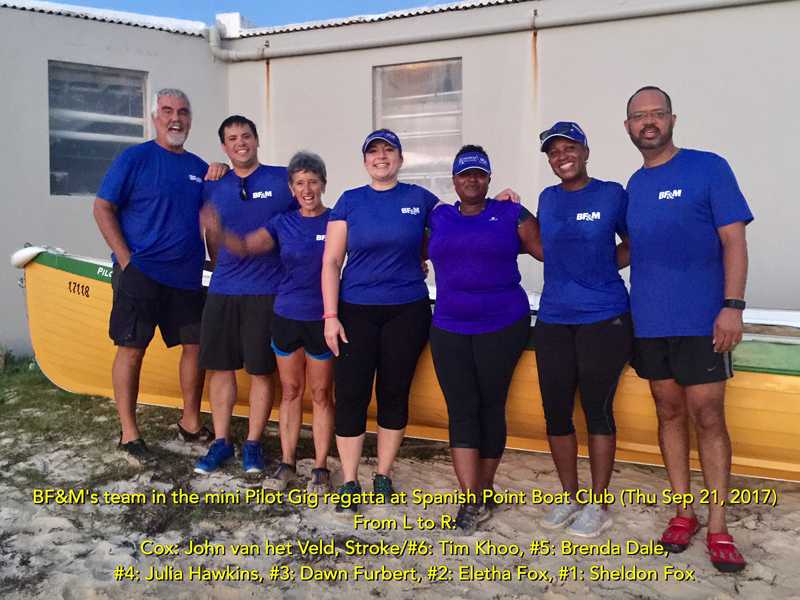 The Bermuda Pilot Gig Club hosted a crew from Lyme Regis in the UK at a racing event held in perfect conditions in the Great Sound on Thursday evening. The first race was a one mile sprint and was won by the experienced Lyme Regis crew, followed closely by a crew from Mariners RFC. The combined crew from Argus and Chubb placed third and the crew from BF&M fourth. The exciting second race was a handicapped pursuit format and was won by BF&M with Mariners only a half boat length behind. They were followed by Lyme Regis and Argus , with only two boat lengths separating the whole fleet. For more information on gig rowing please contact Roger Gillett at rgillett@logic.bm.